Tile is truly a superhero building material. We almost always see it in bathrooms, because it stands up well in damp conditions, it’s resistant to staining, and it’s easy to clean. It’s durable and stylish enough to be used on the floors, walls, shower stalls, and even as a decorative accent. Sometimes the entire room is tiled! Inlaid black and white tiles mimic the appearance of an area rug (which wouldn’t be a very practical addition next to a bathtub), calling attention to the sleek white pedestal tub. This is a great example of using tile design to cleverly break up a larger room. 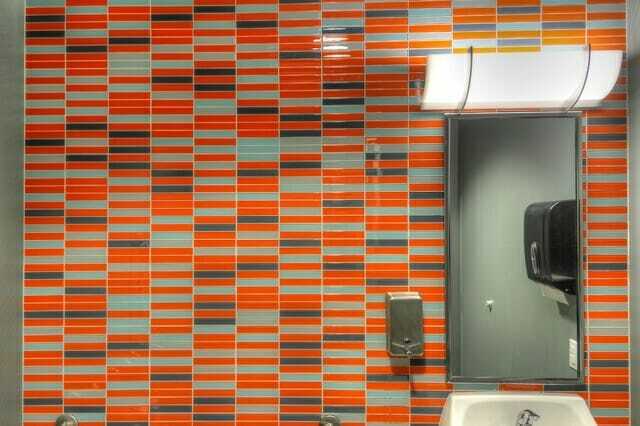 Polished glass subway tile in a vibrant orange hue gives a bathroom a fun, modern vibe. Because it’s impervious to water, tile is a great choice in high-traffic bathrooms that might be prone to lots of splashing. 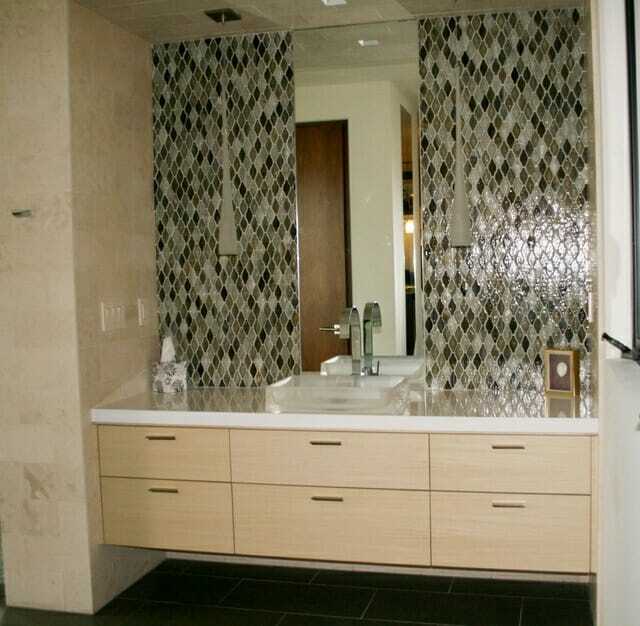 Glass tile reflects light well and can help make a small space feel less confining. For a truly luxurious master bathroom, there’s no other choice but marble. 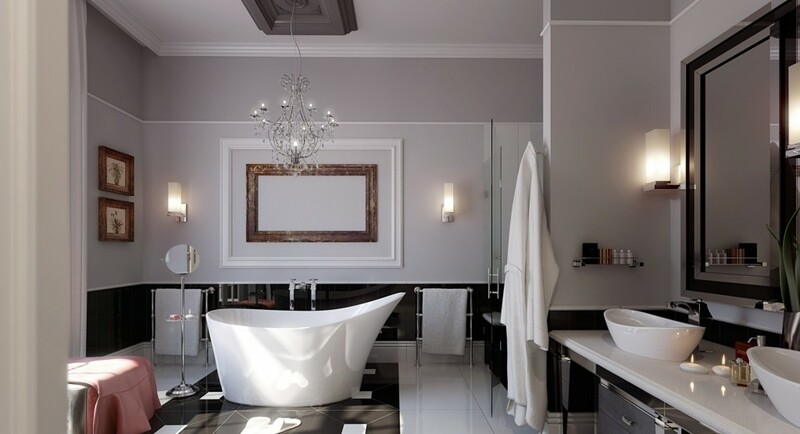 Using it for the floors as well as the walls creates a truly opulent bathroom. 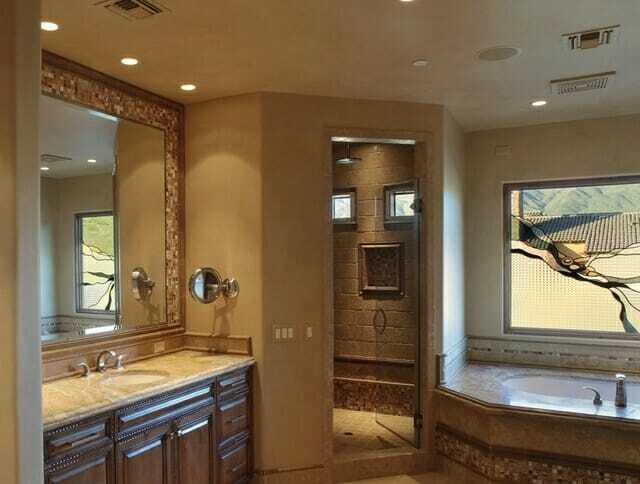 Both Carrara marble and Calacatta marble are commonly used in bathrooms. Carrara marble tends to be a bit grayer and features softer veining, but you should choose Calacatta marble if you’re looking for bolder, more dramatic veining and an overall whiter appearance. 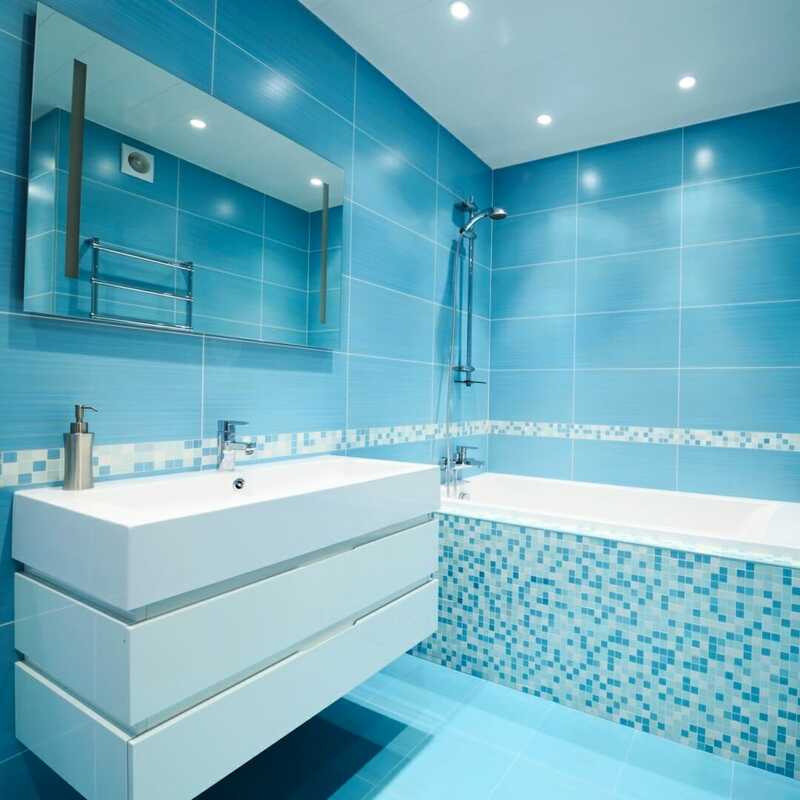 A blue tiled bathroom is clean and serene. Selecting different types and sizes of tile in the same color family creates a monochromatic bathroom with depth and texture, despite sticking to the same material. 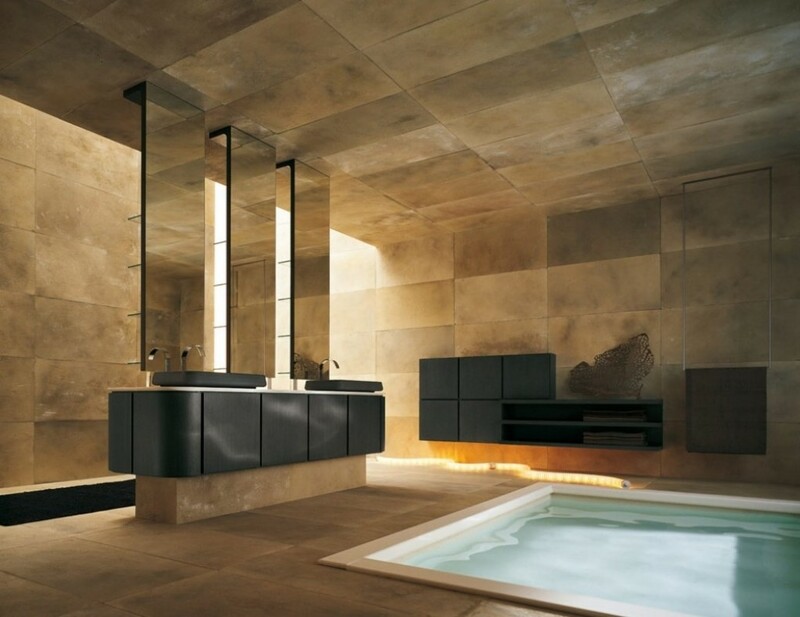 If you want your master bathroom to feel like nothing less than a world-class spa, choose slate tiles for the floor. Slate is a natural stone that’s extremely durable and stain resistant. 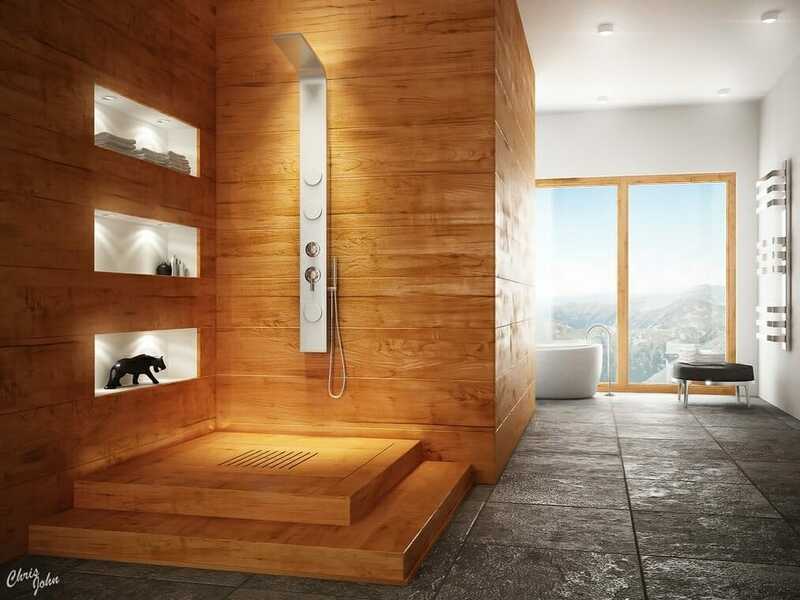 It also tends to be warmer than other natural stones, such as marble, and that’s an important consideration for a room you’ll most likely be barefoot in. If you have the space and want a dramatic look, consider extending the tiling to the ceiling, as well. 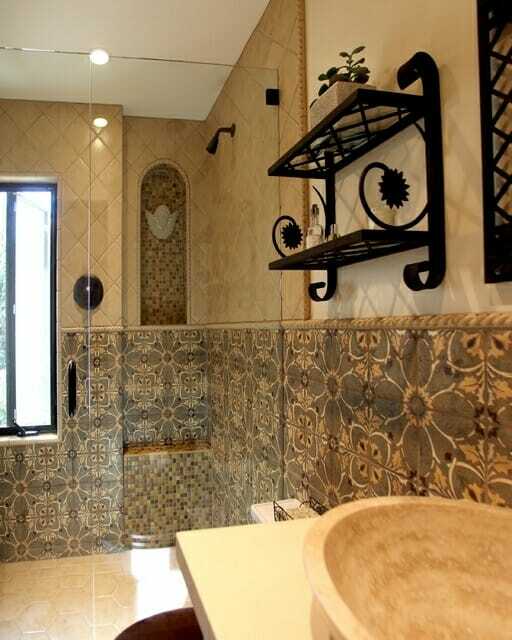 Warm travertine tile, a natural stone just like marble and slate, creates a cohesive look in a large bathroom. Tile can also serve as a design element in much smaller quantities. 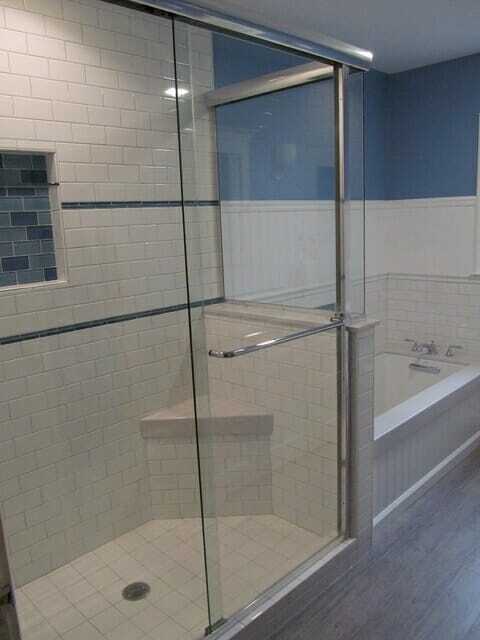 Small glass tiles can create a mosaic borders around mirrors or soaking tubs. Since glass tiles are available in nearly every color imaginable, they can work in virtually any bathroom and with any decor. Tiny bathroom? Don’t let that stop you from choosing tile. Opting for a small-scale tile for the floors can actually make the room seem larger. A simple black and white pattern packs a big punch of visual interest without overwhelming the space. Bathrooms that mix different types of tiles feel fun and contemporary. While the floor is a rather expected natural stone tile, the angled inlay keeps the room from feeling too boxy. Hand painted tiles become a unique backsplash behind the sinks and tub, and the clean lines of the shower keep the focus on the rest of the bathroom. Decorative, hand painted tiles can pack quite a design punch, particularly when used in smaller quantities, like in a shower stall. If the budget allows, these are worth splurging on for the visual interest they add to the bathroom. Here’s another example of decorative tile done well. This time the tile extends halfway up the wall, but the larger design and muted color palette keep it from overwhelming the rest of the room. Think outside of the box and look for tiles that are a unique shape, such as these diamond shape tiles. While they might not work for covering a large surface like a floor, they do work great in smaller areas, such as a backsplash behind the sink. Hexagon tiles are another unique shape to utilize in the bathroom. In an understated marble and laid out in a honeycomb pattern, the look is fresh and clean. Lusting for an architectural detail that’s just not happening in your bathroom? See if you can recreate the look with tile. Glass subway tile in muted tones mimic the look of exposed brick behind the soaking tub, with nary a brick in sight. 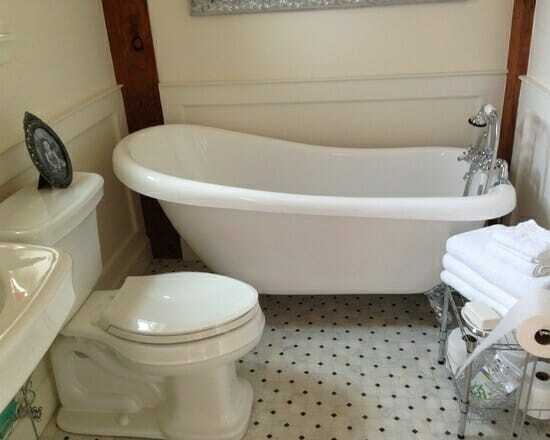 With all of the many tile options available, the old standby white porcelain can still be a great option in a bathroom. It compliments a variety of decorating choices and will keep your bathroom feeling fresh for years to come.